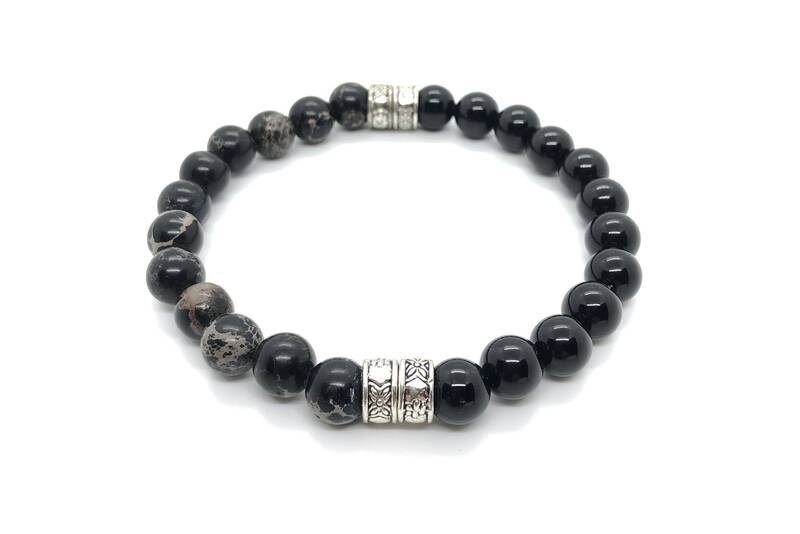 Men's bracelet with onyx beads and black Imperial jasper (8 mm) with silver bead. The term Jasper comes from the Orient and in antiquity was synonymous with quartz, in ancient Egypt were used as amulets, tallándolos in the form of a beetle, and in the Middle Ages was considered the stone of the victors, who embedded in their swords, as was the CA So of Sigifrido who wore a jasper on the hilt of Balmung. Jasper brings together the precious virtues of comforting the spirit, trying to succeed and giving back the joy to a taciturn being.